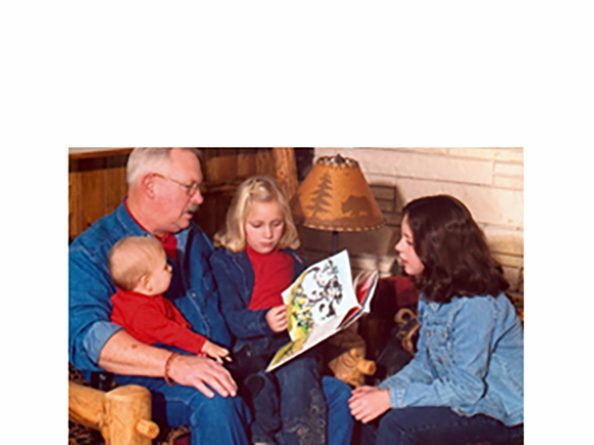 Above: Sen. Hansen reads to three of his granddaughters. Just to the right of Sen. Tom Hansen’s capitol office door, there’s a small, antique desk. Perched on the worn desktop is a portrait of Hansen’s grandfather, sitting at that very desk, as a member of the Nebraska Legislature. He served in the state House of Representatives from 1924-37, when the Unicameral was adopted. Hansen recalls finding boxes of his grandfather’s correspondence from 1919-40. Inside the boxes were hundreds of constituent letters and his grandfather’s responses. Reading the letters made an impact on Hansen. “You could tell that there was a flavor of respect and I really appreciated that,” he said. Although his grandfather passed away when Hansen was 11, the letters offered a glimpse into what had been a very important chapter in his grandfather’s life: representing the people of Nebraska, a chapter that Hansen has just now begun. Hansen graduated from the University of Nebraska–Lincoln in 1970 with a degree in animal science. He is the secretary and treasurer of his ranch near North Platte, which has been in the family for five generations. His connection to western Nebraska is apparent in both his cowboy boots and hat, but perhaps most obviously in the pride in his voice as he describes the landscapes and lifestyles of his district. “I used to carry my camera everywhere,” he said. Whether he’s capturing the landscapes through the lens of a camera or through welded sculptures, Hansen said he tries not to overlook his environment. “It helps me to stop and appreciate the things I see all the time,” Hansen said. He appreciates his environment in other ways as well. Hansen has been a member of his local natural resources district board for 12 years and has served as the president of the Nebraska Cattlemen. He has also been a member of the Lincoln County Cattlemen and was involved in NebraskaLand Days.